Happy Monday! How was your weekend?? We were busy with friends, church, and getting our home ready for Christmas – from the outside that is. Having had much experience with hanging lights and wreaths during bitter cold weather in the past, we finally mustered up enough motivation to get our halls decked. 42 degree weather wasn’t exactly balmy, but it definitely beat anything below freezing! We’re officially ready for our first big snowfall. Just so we’re able to start off the week on the right foot, I decided to make you the cutest mini chocolate and peanut butter bites. I stumbled upon this recipe a couple of weeks ago and knew immediately that I had to recreate it for you. This is a true time-saver and easy as can be. Ideal for those times when you have unexpected company coming over or whenever you feel like making an incredible dessert without much effort. And hey, we’re talking peanut butter, chocolate and crunchy rice cereal. An unequaled combination. 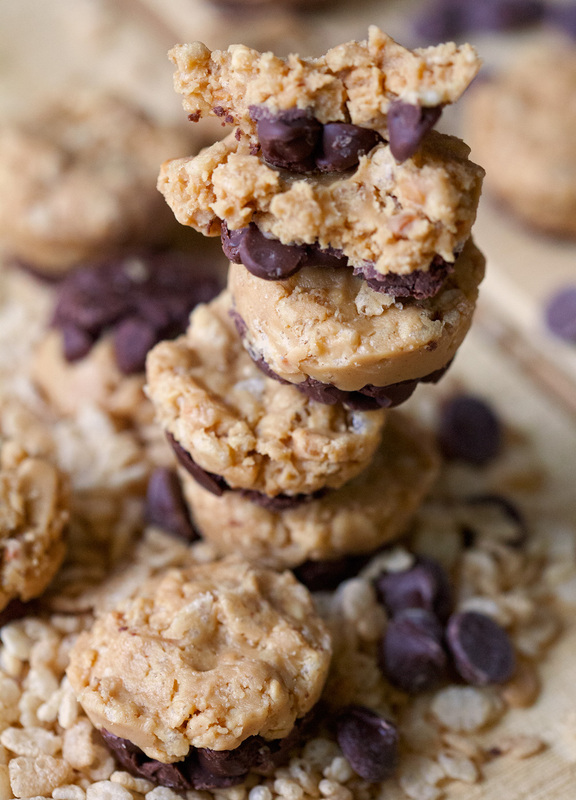 No matter what your skills are in the kitchen, you can’t go wrong with these Buckeye Mini Bites! I’ve been loving small, bite-sized treats lately. They are so much fun to make and I can’t help but being smitten with how adorable they look. 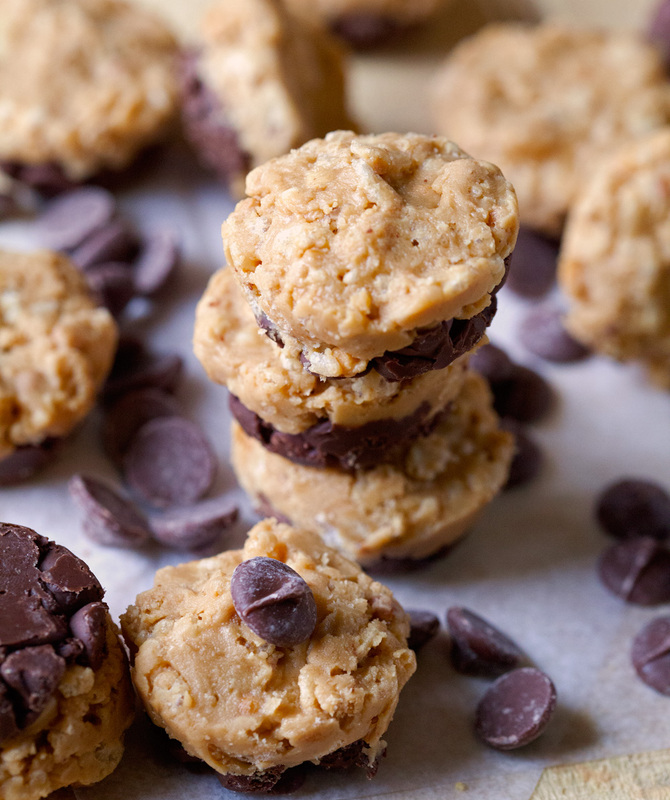 These small bites are similar to regular peanut butter cups – creamy, melt-in-your-mouth goodness – so good that you can never stop at just one, right? Only better. The addition of crispy rice cereal really sets it over the top. 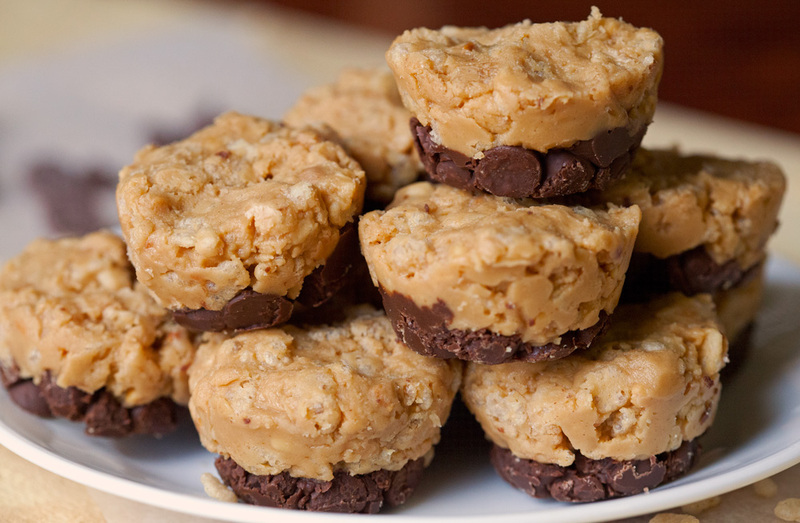 A welcome crunch to cut through the richness of peanut butter and chocolate. Yes, Yes, YES! I can’t help but get excited when something I’ve been wanting to make turns out wonderfully. I am sure you will become a huge fan of these once you try them. Even our kitty, Millie, couldn’t help but take a good sniff at the sight of these. All manners and training aside – sometimes you have to take a risk, even if it’s only for a short moment. Millie assured me that it was worth it and who could argue with a face like that? Now that’s what I call a successful kickoff. 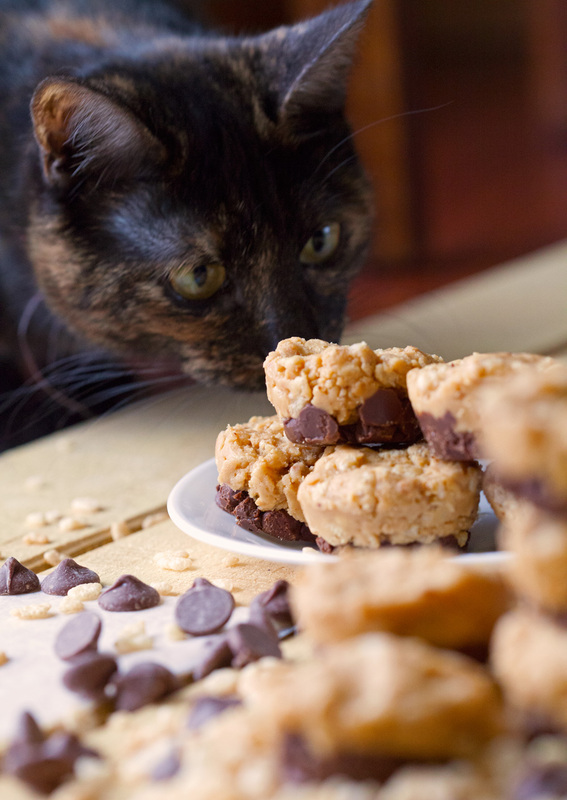 Buckeye Mini Bites are so easy to make and prepare, but you would never know by the way they taste - absolutely delicious. 1. Grease your mini muffin pan. Fill each muffin cup with 1 tablespoon of semi-sweet chocolate chips. Put muffin pan into the oven until the chocolate chips start to melt (don't melt completely), about 5 minutes. Take the muffin pan out of the oven and smooth out the tops with the back of a spoon. Set muffin pan aside. 2. Meanwhile, mix together the peanut butter, butter, and vanilla. Once combined add the confectioners' sugar and blend. Lastly, add the rice cereal and mix well. 3. 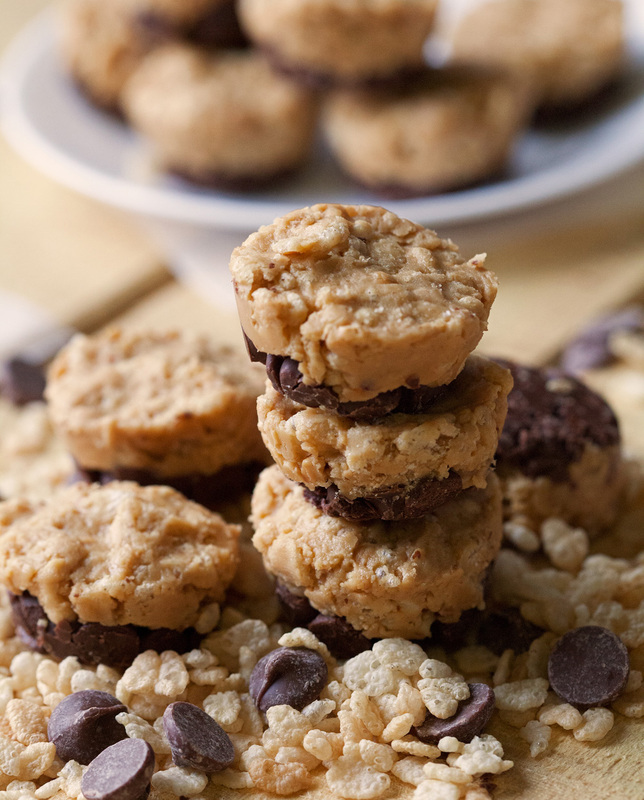 Top each chocolate cup with enough of the crispy rice cereal mixture until filled. Refrigerate for 30 minutes or until ready to serve. Buckeye Mini Bites will keep for up to 5 days in an airtight container in your fridge. 1 cup. I updated the recipe. Thank you! Thanks! They are in the fridge right now! Awesome. I hope you’ll love them. Let me know how they turn out :)!